Feast Thailand, Hua Hin's #1 Food Tour company, is a fully Thai-owned company setup in Hua Hin, Thailand. Operated by Food Discovery (Thailand) Co., Ltd. Feast Thailand operates food tours in and around the Hua Hin district area. If you are looking for an alternative to a cooking school in Hua Hin, try a unique food tour instead. We want to offer travellers in Hua Hin a unique perspective on the culinary marvel that is Thai Food. It is our aim to show our guests the true nature of Thai Food, in all its glory. It is our belief that if you show travellers how Thai food truly is on a day-to-day basis, their appreciation will run much deeper. It is with this in mind that Feast Thailand was born. Being on a Feast Thailand food tour will encompass embarking on an amazing food journey of the flavours of Thailand. With some familiar favourites, along with more unusual selections, we will challenge the way you see and taste Thai food. We will provide you with one of the more unforgettable food experiences of your life. From the bustling Chat Chai market in the morning on our Foodies' Food Tour, to humble local dining venue on our Eat Like A Local Tour, our team will guide you through the myriad of Thai food we showcase, as we sample some of the best Hua Hin has to offer. Our Thai tour guides and assistants possess a wealth of knowledge, allowing them to be able to lead your food journey. We have a very personal approach across all tour styles. We offer a comprehensive range of Food Tours to suit any type of traveller to Thailand. All of our tour vendors have been tried and tested by our team to ensure the food is both authentic and that the vendors are employing clean, safe food hygiene practices. We also like to include the unexpected on our tours. Local street food vendors on foot, pushing their carts, sell their wares on the streets of Hua Hin, or pop up briefly on a street corner with their cooker, ready to whip up delicious, fresh food and then move on to another location. These opportunities to taste will not be missed by our tour guides. The vendors we stop at along the way, the foods we sample and the number of items we taste on tour are likely to change slightly to reflect seasonal produce, vendor opening hours and availability. Our tours are designed to enrich your knowledge of Thai food and how to get the best eating experience out of your holiday in Thailand. This will also assist you when you arrive home, as you take back valuable knowledge to your homeland. We also handle Private Tours, so if you fancy planning your own specialised itinerary, or you prefer to do one of our existing tours with just a select few, like your family or friends, or if you are just happy to let us take you on a food exploration journey, please get in touch on +66 (0) 32 510 207 or click here to send an email and we will endeavour to assist you. Feast Thailand are also lucky enough to have an extremely experienced Corporate Tour planner. Her vast knowledge and experience in the world of arranging conferences and activities for corporations will have your corporate event living in the participants' memories for a long time to come. Should you require information on such corporate planning, please contact us and let us put together your next itinerary. At Feast Thailand, we are very proud of our affiliate partners, without whom, what we would be able to offer would not be the same. This gem of a place on Neabkehard Road serves primarily NorthEastern (Isaan) food and does so very, very well. We have included Baan Thong Kham on our Foodies' Food Tour. Salma Curry is your one-stop spice shop in Hua Hin's Chat Chai market. They have the freshest curry pastes and spices for every type of dish you could wish to create. We include a visit to Salma Curry on our Foodies' Food Tour. 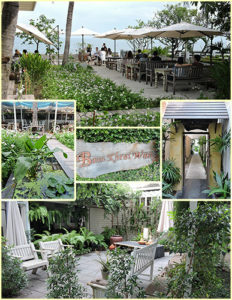 Baan Khrai Wang offers some of Thailand's best Royal Thai cuisine, served in an elegant seaside location. They also do cakes, pastries and coffee. Feast Thailand is also very pleased to have partnered with 2 of the largest booking agencies in the world, in Agoda and Booking.com. Being such a large company, they are able to offer competitive rates on vehicles all over the world, with instant confirmation and no credit card fees. More than just a bus booking company, you can also use them for hotels, ferry and select train bookings in Thailand. We have found them to be reliable and well priced.